Do those lovely, shiny, colourful packages always fulfil their early promise? The best thing about Christmas presents is often the anticipation rather than the realisation. Even assuming you get what you want, and you give others what they want, you still need to comply with the unspoken, unacknowledged rules of present giving. No wonder Christmas is a time of broken dreams and seething resentments. My sister fell foul of the unwritten rules when, as a young teenager, she bought our grandfather a pocket watch. After all, what could be more suitable for a grandpa born during the reign of Queen Victoria than a pocket watch? Disappointingly, he received it with an air of bemusement. This was the wrong way round; surely watches were what grandfathers bought their granddaughters. 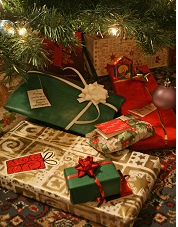 Not surprisingly, there is much anthropological research on present giving and its meaning in different societies. In the west, balance and reciprocity are important aspects of it, and people who knowingly transgress the unwritten rules are not popular. To give too lavish a present is not good: it is to flaunt your (relative) wealth in an unacceptable way, and to exert power over the recipient because they cannot afford to reciprocate and therefore remain in your debt. Too mean a present is an insult; it signals all too clearly the low value you place on your relationship with the recipient. Yet not all welcome presents are expensive. To my mind, you can’t beat a useful present you didn’t know you needed. The windscreen ice scraper with a woolly mitten attached was just such a present, and I think of the giver affectionately whenever I use it. In the lean years after the end of the war, my aunt apparently used to wish that someone would give her a big box with cleaning products in it: Vim, Lux soap flakes, Windolene. Her budget was so tight it was a stretch to afford those things after she had paid for rent, food and other necessities, so to know that she had a supply laid in would have been bliss. Really enjoyed reading What I Really Want For Christmas. I have often been the recipient of gifts that have been re gifted ! On a couple of occasions with the original cards inside the box . This year I received a very early gift from an unexpected source that caused me some angst as I struggled with the “do I don’t I “return the gesture . As I had already decided this year that instead of gifts we would up our Charity donations I sent a card saying that her gift would be a goat from Oxfam that would benefit a family in need. So this year instead of purchasing gifts that can be re gifted everyone has a card telling them that their gifts are goats,pigs,chickens and birthing kits all helping others. Not sure how this will be received but I am happy. ( of course I still have my indulgent desire – a small bottle of Chanel No 5) oh dear! Thanks. Great idea to go with the charity donations. (This is what Dame Barbara proposed in her ‘SLH rules’ blog two years ago.) My sister always gives me a charity present. The best one was when she signed up our downstairs loo to the toilet-twinning project, so we are now twinned with one in Congo!